For those of you who aren’t quite as social savvy, let me begin by defining what a hashtag is and how to effectively use hashtags on LinkedIn. First, it is a designator added to an article or post that identifies the topic. On LinkedIn, you can search for a hashtag to join a conversation based on common topics or interests. Create hashtags for your personal brand. What is your expertise, and what are you known for and post about? 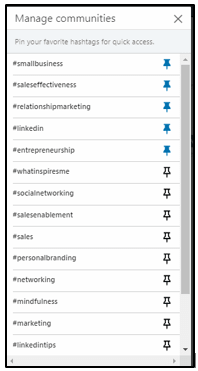 Be sure to add the relevant hashtags to everything you post on LinkedIn. Before you start using hashtags, do some research. A good place to start is to look at posts from other leaders in your niche and see what they are using. I recommend you also research leaders in your niche on Twitter and Instagram to learn how they are using hashtags in their posts and follow their lead. No reason to work any harder to figure it out than from those already using them. It is a good idea to keep a document with your relevant hashtags that you can update as you see additional hashtags you may want to incorporate. Incorporating hashtags is also a savvy move for professionals who use LinkedIn for lead generation. 2. Select an option from the drop-down of suggestions that appears as you type. 1. 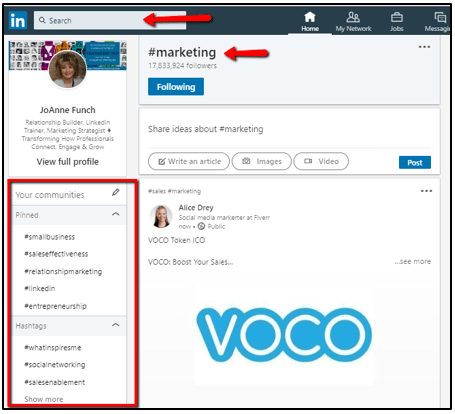 Click the Dropdown icon next to Hashtags you follow on the left rail of your LinkedIn homepage. • If you follow more than three hashtags, click Show more to view your full list of hashtags, then click See all. If you pin the hashtags that are most relevant for you, it will save you the extra step of clicking Show More and serve as a reminder to use your key hashtags when you post updates. 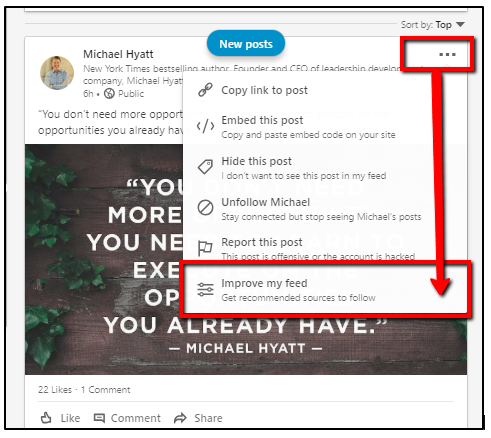 Improve your LinkedIn feed by discovering new content and customizing your feed preferences. You can follow or unfollow people, companies and hashtags for topics you’re interested in from desktop and the LinkedIn mobile app. Note: All edits to your feed preferences completed on mobile will transfer to the desktop experience. 1. Click the More icon on the top right corner of any post. 2. Click Improve my feed. • Follow fresh perspectives – This is a list of recommended sources to follow. Click Follow under a person, company or hashtag to add content to your feed from that source. • Following – This is a list of people, companies or hashtags you currently follow. Click Following below the person or company to stop seeing content in your feed from that source. The displayed will change back to Follow. • Followers – This is a list of people who currently follow you. Click Done in the top right corner of the page to return to your feed. There are all sorts of ways to weave hashtags into your LinkedIn marketing. I suggest using one or two hashtags in your engagement strategy with a comment only if it makes sense and is appropriate. First and foremost, you never want to take away from the person’s post you are commenting on, with that said, using hashtags to make a further point that enhances the original authors content. Hashtagify.me – this tool is great for checking out the popularity and uncover influencers that are using them. They offer a free and paid version of this tool. The first use of hashtags was in 2007 and created by online users to discuss specific events and relevant issues and was posted on Twitter. Now we use them to follow current events, industry trends, niche conversations, research and to grow influence. If used both properly and thoughtfully, hashtags can elevate you and your brand. Becoming a socially savvy hashtag user remember to adapt your LinkedIn hashtag strategy to this platform as you would with other social media platforms.